This is a complete lesson including a Lesson Plan with the Common Core State Standards indicated, instructional focus, instructional procedures, objectives/goals, direct instruction, guided practice, enrichment, and differentiation activities listed. The Student Worksheet is an effective method to encourage and teach note taking skills and works in conjunction with the Power Point presentation. 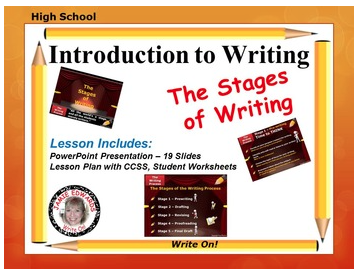 The Power Point presentation instructs students in each of the stages of writing in an engaging manner. The use of animation and vivid color grabs a student's interest and helps maintain their interest. This lesson is a great tool to introduce writing for any type of essay - Argumentative, Persuasive, Explanatory, Informative, Descriptive, Expository, and Narrative. It is also a wonderful lead in to the 6 Traits of Writing.